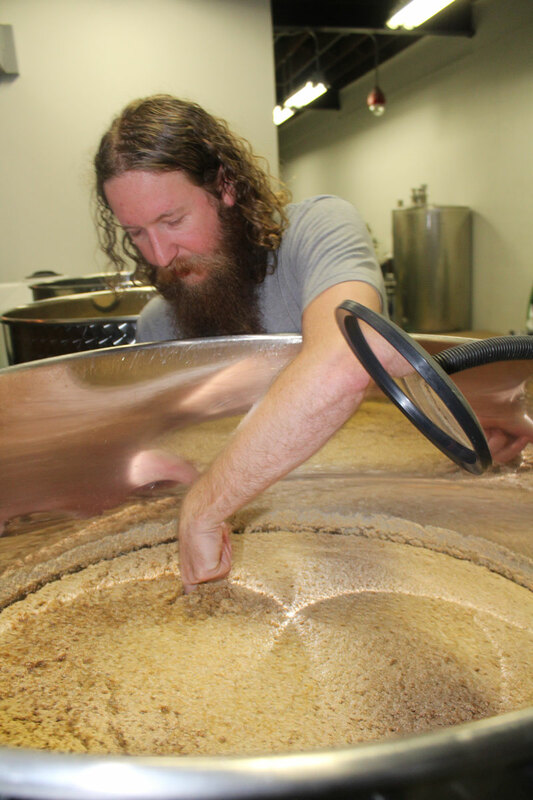 Josh Torbett, distiller at the Chattanooga Whiskey Co., checks the progress in one of the fermentation tanks. The bill set in writing the state’s first standards for distillers wanting to call their product Tennessee Whiskey, or as Jack Daniel’s does, Tennessee Sour Mash Whiskey. It is designed to match federal standards for bourbon, but distillers will have to jump over many barrels to comply with those standards. It was heralded by some whiskey makers and jeered by others, especially Tennessee moonshine producers whose non-aged spirits could not be called ‘Tennessee’ whiskeys. The standards inked by Gov. 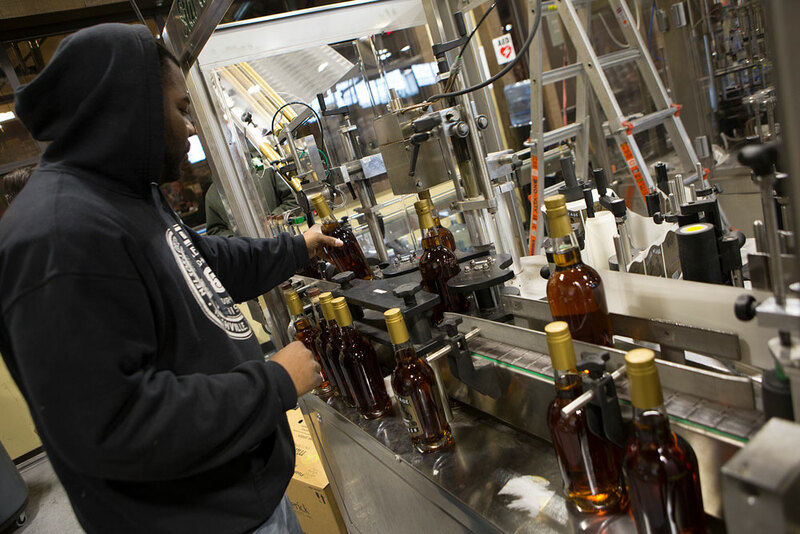 Haslam stemmed from a designation granted the state by Congress more than a half-century ago when it declared bourbon a distinctive U.S. product. By law, Tennessee Whiskey must contain at least 51 percent corn. It cannot have any additives besides water, must be distilled at less than 160 proof, use what’s called the ‘Lincoln County’ charcoal-filtering process and be aged in “new” charred white oak barrels. Distillers not following those guidelines cannot sell spirits as Tennessee Whiskey. Billy Kaufman is president of Short Mountain Distillery in Woodbury, which since 2016 has produced a true, small batch, 93 proof whiskey aged in new charred white oak barrels. Short Mountain also crafts Tennessee Shine with a lot less legal wrangling. But Kaufman says there is more difficulty in distinguishing spirits not meeting the Tennessee standard than those that do. Tennessee craft distiller Nelson’s Green Brier Distillery in Nashville supported the standard-setting legislation. “Holding ourselves to a higher standard will ultimately be better for all the people in the category,” co-owner Charles Nelson said in 2013. Jay Lee works on the bottling production line at Nelson’s Green Brier Distillery, located in Downtown Nashville at the Marathon Motorworks complex. One lobbyist went so far as to say the standards meant that all Tennessee whiskeys had to taste like Jack Daniel’s, even pleading that if all beers had to be made like Budweiser this country wouldn’t have a Sam Adams or a Yazoo. At the time, the lobbyist also represented Popcorn Sutton Distilling, named for the legendary East Tennessee moonshiner and bootlegger Marvin ‘Popcorn’ Sutton, whose distilling methods are still being used at many craft distilleries. However, it is hard to argue that moonshine and Tennessee sour mash whiskey have much in common other than high alcohol content. “Moonshine has a strong tradition and history, but it was illegal so standards didn’t apply,” explains Bruce Boeko, proprietor of Nashville Craft Distillery. All forms of alcoholic beverages (beer, wine and spirits) are based on fermentation, which is the natural process in which yeast consumes sugar, leaving alcohol. Whiskey, including Tennessee Whiskey, is any distilled spirit made from a fermented mash made of grain. Brandy, for example, is a distilled spirit made from fermented mash made of fruit such as grapes or apples. As such, is not whiskey. The four primary steps to make whiskey, the Tennessee Distillers Guild explains, are mashing, fermenting, distilling and aging. Each distiller uses grain combinations chosen by that distillery to produce a specific type of whiskey. Tennessee Whiskey must be at least 51 percent corn. Other common grains in Tennessee Whiskey are barley, rye, and/or wheat. Those grains are ground into a fine meal, mixed with water and cooked until the starches in the grain have been converted into sugars. The process creates a mash that is mixed with yeast, which then converts the sugars into alcohol. The fermented mash, also known as beer, is then pumped into a still and heated. Evaporation and steam condensation allows the alcohol to separate from the water and grain byproducts. If this reads like too much science, here comes the cool final part of the process. Whiskey, like all spirits, is colorless when it comes off the still. The distilled spirit must be aged in an oak container to become whiskey. Tennessee Whiskey goes another step, requiring that the spirits first be filtered through sugar maple charcoal (the ‘Lincoln County’ process) before being aged in new, charred white oak barrels. 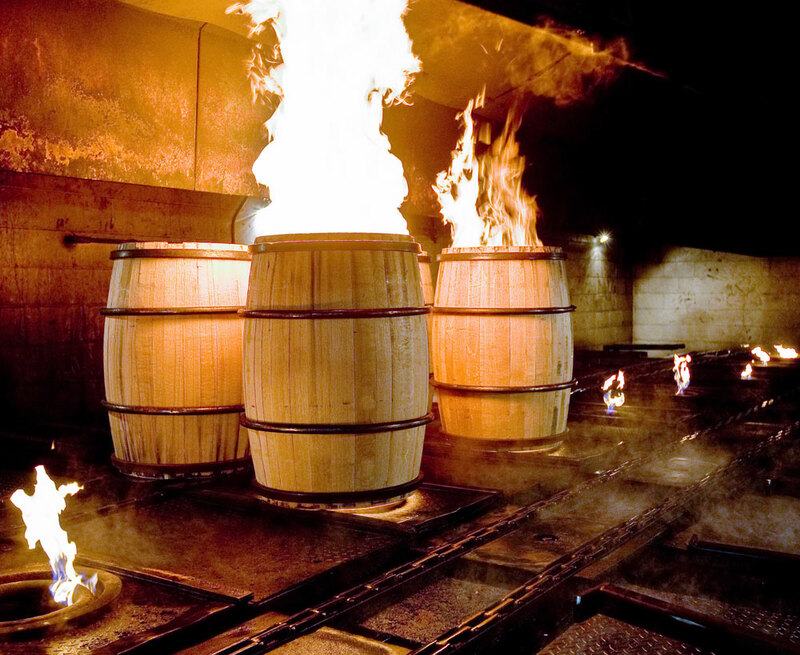 The whiskey’s color and flavor are formed during the aging process. Once completed, and after years of waiting, the aged spirits that followed those standards can be classified as Tennessee Whiskey. Comparatively, distilled spirits can be classified as brown spirits or white spirits. Brown spirits are spirits aged in wood barrels and include aged rums and tequila. White spirits are unaged spirits such as vodka, gin or clear, unaged rum. Jeff Arnett, Jack Daniel’s master distiller, says the company would never compromise standards by reusing barrels or using artificial ingredients. “We’ve been making whiskey a long time, and we know that would not uphold the quality that people expect from Tennessee whiskey,” he explains. Natalie Vincent of Pennington Distilling Company in Nashville says folks from Jack Daniel’s and George Dickel have shared their expertise and experience with Pennington and other craft distillers for a simple reason.